With less than a month to go before the 2015 London Toy Fair, I thought it'd be a pretty good idea to start getting ready. 2015 will actually be the 5th year I have attended the Toy Fair and the 3rd year I have covered it for UK NERF. Although it's a hectic and fairly stressful day out, it is a great opportunity to meet up with the bods at Hasbro Europe and take a look at some of this years most hotly anticipated blasters. At the beginning of 2014, we got an exclusive hands on look at the new Zombiestrike blasters and Demolisher 2-in-1. So what could be in store for the 2015 event? Hasbro's mail-outs are usually a fairly dry affair, but the most recent Christmas email contained a very interesting graphic. Looks like there will be a big announcement on Boxing Day, but what could it be? German blog Dartblaster.de recently went on a visit to Hasbro HQ in Germany and managed to give us a glimpse of a brand new ZS blaster. Could this be what all the fuss is about? Fire up that rumour mill and let us know what you think. Looks like all that excitement was for nothing. Despite having officially released the blaster weeks ago, Hasbro's big boxing day announcement turned out to be the Zombiestrike Flipfury. Rather disappointing really. Thanks Hasbro. I love receiving parcels. Every time I hear the postman's abrupt, officious knock at the door I turn into a small boy at Christmas, dashing to the door to see which recent purchase I'd be playing with next. So imagine my surprise and confusion when I receive an international parcel that I was not expecting. Looking at the label, I see the word 'Blasterparts' and that small boy feeling wells up inside me once more as I realise what the parcel might contain. Whilst sounding more like an engine part than a toy, the CAM ECS-12 is one of the newest blasters in the NERF range and is also the first ever blaster to feature an integrated camera. With it becoming easier and easier to make and share home videos via the interwebs, this blaster will provide NERFers with the ability to record their antics and share missions and skill shots with their friends through social media. At least, that's what I thought at first. I hadn't been to my local Toys 'R' Us in a while so Christmas shopping seemed like a good excuse to go back. 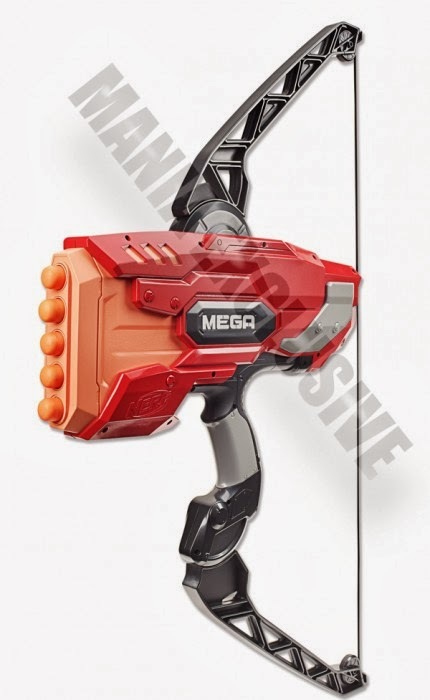 Browsing through the usual NERF goodies, I happened across a Longshot and almost had a heart attack. It's nothing new to see a Longshot CS-6 in the UK, they have always been available here as an exclusive to TRU but this is the first time I had seen one in a shiny new box. Sadly it's just a bit of re-branding, bringing the box design of the Longshot into line with the look and feel of the Elite range. Although the N-Strike logo is clearly shown, I can't help but feel this is a subtle move to 'fool' consumers into thinking it's the same as the rest. The only thing that is different is that this package comes with 6x Elite darts. Same old clips, same old blaster(s). Personally, I love the graphic advertising the range. 10m, like it's something to brag about! Well, it's not the amazing find I initially thought it was, but at the very least it means that the Longshot will be sticking around for a while. Or: 'the joy of spur of the moment buying'. I am not really a huge fan of the NERF Elite Triad. It's only crime? In this reviewer's opinion, it's simply trying to hard. The Triad is a great blaster, but in its efforts to be a multi-shot blaster, it sacrificed its looks. It feels bulky, the priming arm looks like a lizard's tongue and it just doesn't feel as elegant as say, the jolt (which ironically, is the very blaster its trying to improve upon). This review is not to talk about my dislike of the Triad, it is a review of what I firmly believe to be it's replacement. 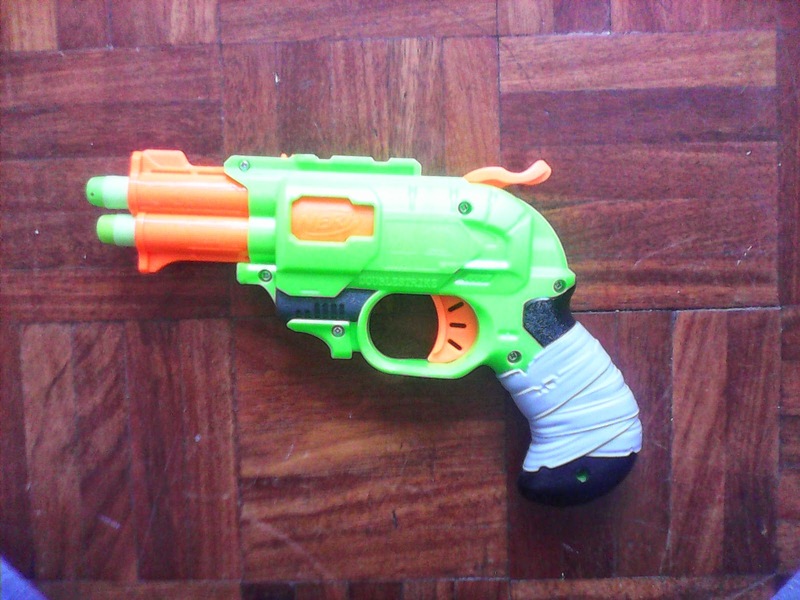 The NERF Zombiestrike Doublestrike. Ever since I started attending Sci-Fi LARP events, I have been hearing the same sentence from many different people, granted the wording is different from each, but the focus is the same. "Yeah these guys are good, but its not like The Green Cloaks". I remember asking "what made them so special as opposed to anyone else?" and then it was explained to me. They don't just spend a day or afternoon doing LARP, they spend whole weekends doing so. The second I heard that, I just had to meet them and experience what the system and seeing if it was for me. Luckily, I was fortunate to be on hand for their 2nd event on the 20th-22nd June and boy am I glad I did! When news broke that most of this year's hot releases were available at Amazon.com, I was furious. Not because the US had gotten the jump on everybody. Not because I had been hunting tirelessly for a chance to get my hands on one early. Not even because I had been assured by Hasbro that there would be no 'soft release' this year. I was furious because when I heard the news, I was working, in a field, in the rain, with no internet connection and no way of getting my greasy mits on them. Alas I had to sit there like a lemon whilst low resolution images of happy people slowly downloaded over my GPRS connection. Things weren't any better when I got back. 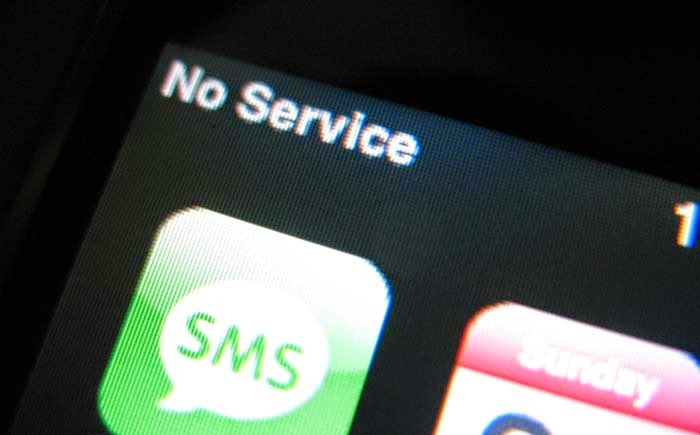 All of my feeds were full of more smug people playing with theirs and when I could finally get online I was faced by those three immortal words... OUT OF STOCK! I managed to get some eventually but the important thing is that they aren't here yet! 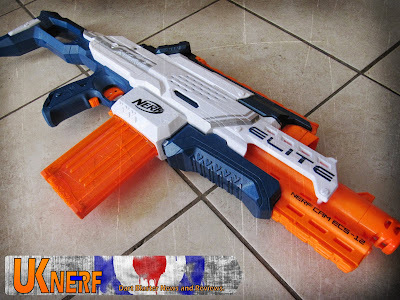 Fortunately for me, my good friend OldNoob managed to get hold of one and was the first to review it on the BritNerf forum. With his kind permission I have reposted it below. It may seem like a cheap ploy to write the first new post in ages, and you'd be right. To explain the title, when I was asked if I was free on the 25th of May for some NERF blasting (and maybe write a review on said NERF blasting) I naturally jumped at the opportunity. However, when I discussed the 'whens and wheres' with UKNerfWar, he informed me that this was going to be a War, not a LARP event which I was used to. This being my first 'War', I asked how many people did he think where coming. "Not many I should think," he replied, "...it'll just be a Casual War." And I couldn't resist really! With news that Mattel are making a new venture into the world of toy blasters spreading like wildfire across the NIC, I thought it was about time to dispell some of the rumour and speculation and actually get these blasters in hand for a review. First thing this morning, I went to my local Argos and purchased every BOOMco. blaster they had and I have been playing with them all day. Below you will find an in depth review of the blasters that I purchased. Brace yourselves. There are some surprises. 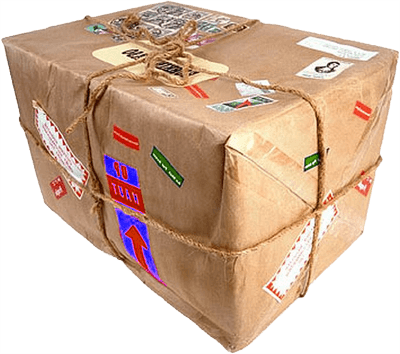 It isn't every day that you get excited when the postman calls but recently the usual utility bills and take-away menus served to cushion the fall of a large parcel. My good friends over at Blasterparts sent me a parcel containing some exciting new products. The first of which was their shiny new 7kg MEGA Magnus spring. Regular readers will already know that Saturday in Bristol was the epicentre of the Zombie Apocalypse. Having not played HvZ since my days at college (and even then it was socks and boffers) I was eager to attend this war despite the three hour drive to get there. The war was hosted on the Downs in Bristol. 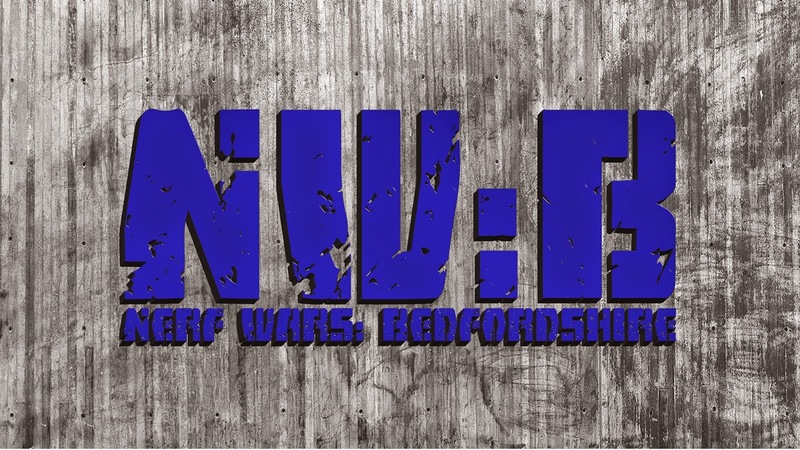 It was organised by my good friend Boff from the BritNerf forum so I already knew this event would be epic. Not only was it the first BritNerf community war of the year but it was also the first ever BritNerf HvZ event. I wasn't going to miss this for the world. Did any humans make extraction and get out alive? Was I one of them or did I get nommed? Keep reading to find out. First up, sorry for the lack of activity of late. Things have been manic! With a workbench overflowing with commissions, a day job and a second child expected any minute, the blog has had to take a back seat for a while. I'm glad to say that I have a bit more free time now and there is a long list of news and reviews planned for the next couple of weeks so stay tuned! 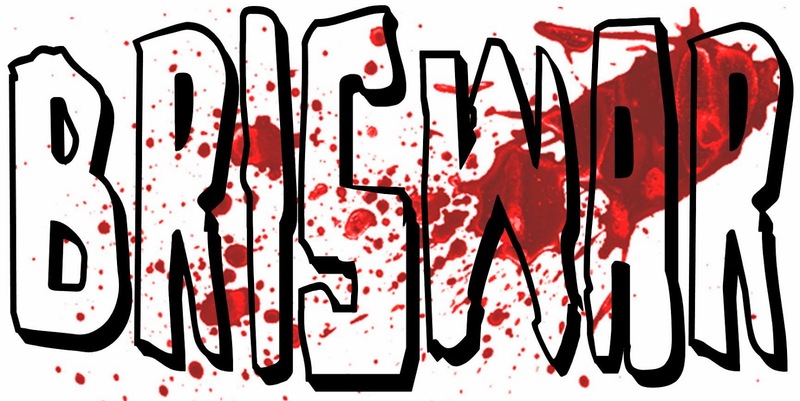 Now, if you have been watching our Facebook Page, you will know that there is a very exciting war coming up in Bristol. 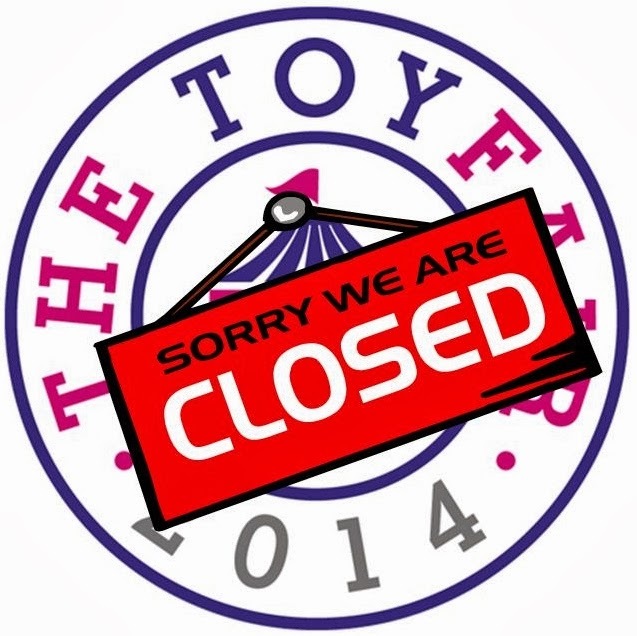 On the eve of the 2014 London Toy Fair I would like to talk a little bit about what I hope to see there. Unusually this year Hasbro have quashed all the usual speculation and rumour by giving us an official look at some of this year's hot new blasters but we can only hope that there is more they aren't telling us. So far a lot of the rumour I have heard has panned out to be correct.